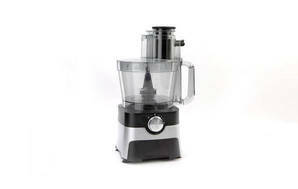 Snapshot: The Home & Co 2L Food Processor FP403 42-525-424 food processor has two speeds and storage for attachments. How does it rate? Excellent at chopping breadcrumbs and kneading pastry (with the dough blade). Very good at slicing carrots and emulsifying mayonnaise. Storage for blades inside drawer in unit. Three chutes (large chute has a safety locking system but it awkward to use). Comes with seven blade attachments. Processing time limited to one minute using the chopping blade. Control dial difficult to grip and use the pulse button. Basic instructions with some processing guides. Attachments not recommended for the dishwasher.